I am referring to the unique work of Toronto based artist and photographer Marina Dempster, whose fantastical shoes are on display at the Bata Shoe Museum until January 19th. Although not advertised, this artist’s work definitely deserves viewing. For those of us who combine a love of extravagant shoes with an appreciation for talented artists, Dempster’s work is a must see. She has created extraordinary shoe sculptures which are a contemporary interpretation of the traditional artwork of the Huichol people in Mexico. After I saw her shoe sculptures, I contacted Marina Dempster, and she graciously agreed to be interviewed. As she explained, the Huichol people have existed since pre-Colombian times, and it is likely that they are related to the Aztecs. They call themselves ‘the healers’ and believe that the perpetuation of life and the protection of nature’s creations is their responsibility. Their art form is known as yarn painting, and it involves the covering of everyday objects with intricate embellishment, serving a healing and story telling function, Dempster related, particularly as the Huichols have no written language. This artist told me that she found herself drawn to the technique of yarn painting. The artistic process begins with covering the discarded object, in this case shoes, with a combination of beeswax and pine resin warmed and softened, then spread on the surface. This covering is then embedded with yarn or beads until the entire surface of the object is implanted. Dempster emphasized that this labour intensive process is contemplative, and for her has lead to communication and learning between cultures. 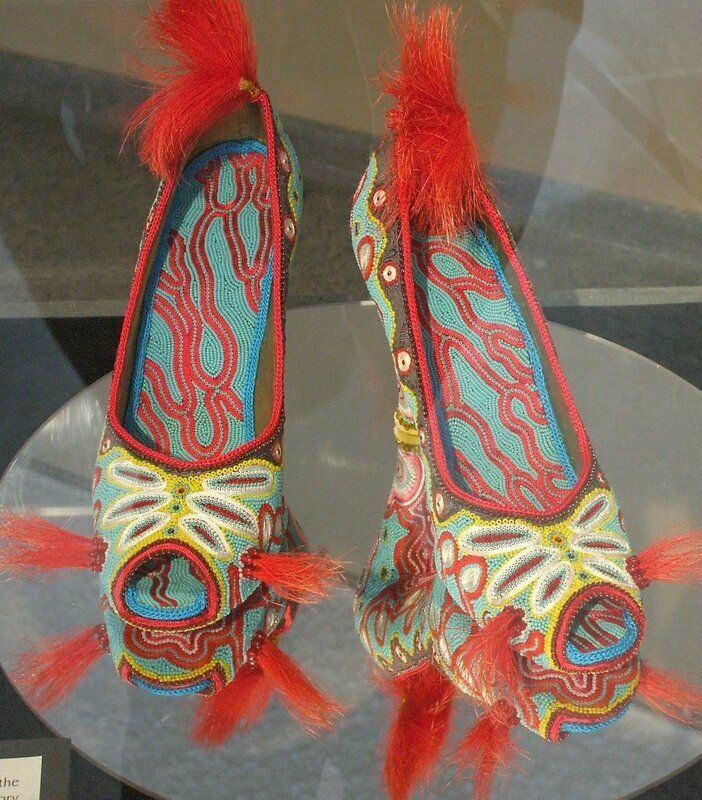 For this viewer, the sheer spectacle of exuberant colour is the first pleasure offered by these storytelling shoes. They practically sing with bright green, red, blue, orange and turquoise. 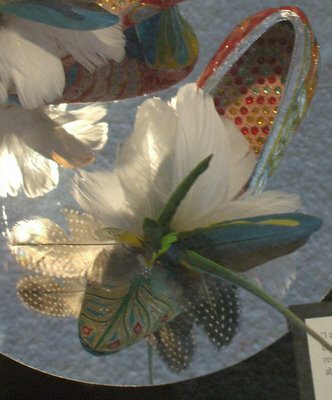 The second is the elaborate and absolute decoration, as every part of the shoe is beautifully embellished. 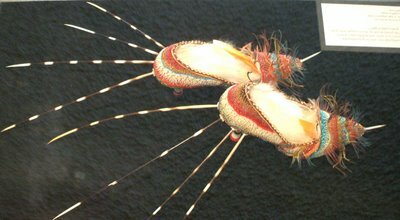 Porcupine quills and lavish feathers extrude from some shoes, while others sparkle with dozens of tiny mirrors. Dempster described her work as a hybrid of multicultural ethnography and haute couture. When asked about the message her shoes have for viewers, she replied “my only hope is that the work brings light to people’s faces... that the pieces resonate with each viewer in a personal and meaningful way”. 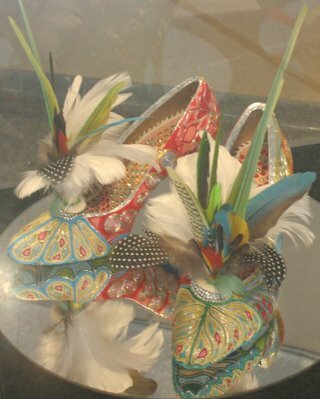 So, if you are visiting Toronto,or live here, treat yourself to the experience of Marina Dempster’s magical shoes. You can find more about Marina Dempster here. Posted by la femme at 12:35 a.m. I love Marina Dempster's work. It's gorgeous. Thanks for sharing. Too pretty! I think most of the time I would rather look at shoes and put them on display than to actually where them...less painful that way. Beautiful, especially the last pair; its walking art (bad pun, I know). I wonder what the shoes look like before the artist attacks? The shoes are imaginatively sublime, but there are no men’s shoes. Yet I am inspired. Perhaps I can embalm my Puma Speedcats in chocolate and Fernet-Branca and mount speakers on them which will play the Brazilian Girl’s "Dance Till the Morning Sun" at abnormally high decibel levels.